FILE - Indian women throw flowers into the sea as an offering during a ceremony for the victims of the 2004 tsunami at Marina Beach in Chennai, Dec. 26, 2016. China is responding to pressure to work with other countries that claim rights to a vast disputed sea by voicing support for India’s proposed tsunami alert system. India’s Ministry of Earth Sciences is working on a South China Sea warning system that would transmit data to Vietnam, Thailand and Malaysia after any earthquakes threaten those countries with a towering tsunami that could wipe out coastal populations, multiple Indian media outlets have said since May. An Indian Ocean tsunami that hit India, Sri Lanka, Thailand, Indonesia and Myanmar among other countries in 2004 killed at least 230,000 people. Beijing has chided India before over use of the South China Sea, but the Chinese foreign ministry says improved early warnings would help every side’s interests. 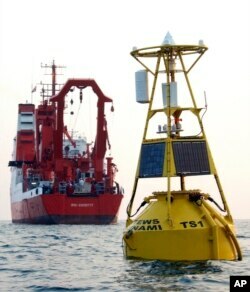 FILE- A buoy, which is a part of a tsunami warning system developed by GITEWS (German-Indonesian Contribution for the Installation of a Tsunami Warning System), floats in on the sea off Java island, Indonesia, Nov. 15, 2005. “It’s not an India-specific initiative from what I remember, so given that background we may not be surprised that the Chinese have not reacted adversely,” said Brahma Chellany, professor of strategic studies at the New Delhi-based Center for Policy Research. South China Sea states may have discussed the tsunami warning system with New Delhi before the plan was made public, Chellany added. Regional interest in a tsunami warning system, the Chinese president’s reputation at home and international pressure on Beijing may have further prompted the consent from China to India, experts say. Beijing claims more than 90 percent of the 3.5 million-square-kilometer South China Sea, overlapping the exclusive economic zones of Brunei, Malaysia, Taiwan, Vietnam and the Philippines. Since a world arbitration court ruled last year against the legal basis for China’s maritime claims, Beijing has sought talks with other players. India does not have a claim to the sea, which is prized for its fisheries, fossil fuel reserves and shipping lanes. But when Vietnam and India’s state-owned Oil and Natural Gas Corp. agreed to explore off the Vietnamese coast more than a decade ago, China “strongly objected,” said Richard Cronin, a Southeast Asia Program fellow with The Stimson Center think tank in Washington. “China has always had an opposition to foreign interference in its domestic affairs, of course, and also in regional affairs, and India, although it’s part of Asia, is perceived as an outside actor in terms of the South China Sea,” said Jonathan Spangler, director of the South China Sea Think Tank in Taipei. India and China dispute two border areas. China also frets over India because it has the world’s second largest population and is historically backed by Western powers. Indian Prime Minister Narendra Modi wants a stronger role for his country internationally, particularly in economic matters around Asia. The tsunami warning system may be set up in Vietnam’s exclusive economic zone, where the two countries are looking for gas, Cronin said. Some parts of the sea are considered less disputed than others, Spangler said, and that would be one. India is apparently planning to deploy just a “big buoy with sensors,” suggesting that India is giving more hype to Chinese approval than seems warranted, Cronin said. Countries from Southeast Asia to Washington dispute Chinese construction of artificial islands for military use, giving itself a lead in controlling the sea. China’s nod to the Indian warning system will likely be a one off, said Jay Batongbacal, director of the Institute for Maritime Affairs and Law of the Sea at the University of the Philippines, Metro Manila. But China may have calibrated the go-ahead to India to show off its conciliatory maritime policy before a Chinese Communist Party congress late this year when President Xi Jinping is expected to seek another term as chairman, Batongbacal said. “They’ve been trying to polish up their image (over) the past year because the coming congress is an important time for Xi Jinping and his consolidation of power, so I think that they’re trying to show that this foreign policy has been working,” he said. Beijing may react more harshly when India actually sets up the warning system, Spangler said. China will start trials this year on its own system, which it is coordinating with a Pacific Ocean tsunami alert setup under UNESCO’S Intergovernmental Oceanographic Commission, the official Xinhua News Agency in Beijing said.